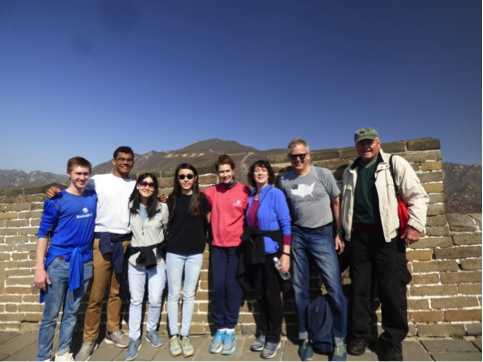 As I scrolled through the 2019 NCISC CD with images from our Beijing trip, looking back on all of the friends we had made and destinations we travelled to, I could not help but think how fortunate I was to have had this opportunity. On the afternoon we toured the Forbidden City, I remember Fran telling our delegation that if he could, he would take all of the students in North Carolina on this trip. Though the trip was only a week long, the experience was truly eye opening, allowing me to take a step back from my corner of the world. This trip was also one of sharing, whether it was explaining my project in Mandarin on a local TV station, performing violin at the closing ceremony, or exchanging contact information with delegates from Ukraine and Denmark. With increases in global collaboration and communication, I believe that science has potential to advance at astounding rates in the near future, which is why it is amazing to see young people from across the globe come together in celebration of science. No matter the country — Italy, Israel, South Korea, Indonesia – all student researchers had a mission to bring their fresh ideas to a global audience. Before leaving for Beijing, I had the hope of learning about different cultures from around the globe. From the gift bags of Israeli chocolates to the Daoxiangcun goody bags of Beijing, I got a taste of all corners of the world! The NC International Science Competition and Beijing Youth Science Creation Competition have been a very meaningful part of my high school experience.